Last week, I posted the August minor league award winners, but today it’s time to start the big, year-end, player of the year awards here at Twins Daily. What I’ll be doing is posting write-ups on the top six or seven players, along with several players worthy of honorable mention. I’ll rank my Top 6, but I certainly welcome your feedback. It seems that pitching has come to the forefront in baseball, ahead of hitting. We see it at the big league level and with several examples, we have seen it trickle into the minor leagues as well. It’s happening in the Twins minor league system as well. There were several starting pitchers (and relievers as you’ll see tomorrow) who performed well in 2014. Again, I encourage you to read through the top starting pitching candidates for Twins Minor League Starting Pitcher of the Year and then discuss and rank them as you see fit. Note also that this is not a prospect ranking. May came to the Twins, with Vance Worley, in the December 2012 trade from the Phillies with in exchange for outfielder Ben Revere. After spending 2013 in New Britain, he moved up to Rochester this year and took a step forward in his prospect status. May put up best numbers since Low-A ball in terms of WHIP, HR/9 and walks per nine. May looked to be in line for a big league call up in June when, after being named to the Futures Game, he hurt his calf. He missed the Futures Game and nearly a month of innings. However, it wasn’t long after his return to the Red Wings that May made his much-anticipated big league debut. He has certainly taken his lumps with the Twins, but he put together a strong AAA debut and earned a spot on this list. Hu was signed by the Twins out of Taiwan in August of 2012. The 20-year-old began the 2014 season at extended spring training and then made three starts for Elizabethton before being summoned to Cedar Rapids. Though he’s always been intriguing as a prospect since he dominated on his national team through his amateur years, no one could have expected him to do what he did with the Kernels. He became the best starter on a team with several highly-regarded pitching prospects. Blessed with a good fastball that has reached 95 mph, he has several pitches that can be good. With the Kernels, he wasn’t hit, didn’t walk anyone and got a good number of strikeouts. Definitely one to watch! Will he start 2015 back with the Kernels or could he start in Ft. Myers? Duffey was the Twins fifth round pick in in 2012 out of Rice University where he was a part-time closer. Since signing with the Twins, he has primarily worked as a starter. In 2014, all 14 of his appearances were at the start of ballgames. He began by going 3-0 in four starts with the Miracle before being promoted to New Britain. In 18 starts with the Rock Cats, he went 8-3. Late in the year, he was promoted to AAA Rochester. The assumption made by many was that he would just make a spot-start in a doubleheader and return, but instead, he finished the season with three starts for the Red Wings and went 2-0. Though he averaged just 6.8 K/9 overall, his strikeout rate actually increased with each promotion. As a starter, he has a three-pitch mix and throws his fastball 91-93 mph. When he ended 2013 in the Miracle bullpen, he hit 97 at times. Will he be able to continue starting right up to the big leagues? We shall see. But for now, he had a very solid 2014 season as a starting pitcher. He should start 2015 in the Red Wings rotation. Rogers was my choice for Twins minor league starting pitcher of the year in 2013 when he went 11-6 with a 2.55 ERA in Ft. Myers after opening last year with three starts in Cedar Rapids. This spring, he jumped right to New Britain and got off to a slow start. Through his first five Rock Cats starts he was 1-3 with an 8.14 ERA and a 1.72 WHIP. His strikeout and walk rates were very good (9.6 K/9, 1.8 BB/9), but he was very hittable. And then a switch flipped. In his final 19 starts, he went 10-3 with a 2.31 ERA and a 1.20 WHIP. His strikeout rate dropped to 7.2 per nine and his walk rate increased 2.4 per nine, but he was pitching so much better. The left-hander is able to maintain 92-94 mph throughout a game. He also has a very good slider. He was the Twins 11th round pick in 2002 out of the University of Kentucky. The 23-year-old will head to the Arizona Fall League next month. He will likely begin 2015 in Rochester and we could see him sometime in 2015. Wheeler will likely become a lawyer at some point after his playing career is over. After his 2014 season, those days may have to wait a while. The 6-8 left-hander was the Twins eighth round pick in 2011 out of Loyola Marymount. In 2013, he went 9-4 with a 3.70 ERA at Ft. Myers but returned to the Miracle to start 2014. It proved to be quite beneficial. Encouraged to be more aggressive with his fastball, his performance was much better. In 13 starts, he was 6-5 with a 2.51 ERA and a 1.22 WHIP. He was promoted to AA New Britain where he made 12 starts. There, he went 5-4 with a 2.78 ERA and a 1.14 ERA. He even made a spot start for Rochester and gave up two runs in five innings. Not a strikeout pitcher, Wheeler averaged 6.5 K/9 through the season. His fastball sits 89-91, though at times he has hit 94. He also has a good changeup and curveball as well. The 23-year-old will likely start 2015 with the Rock Cats depending upon who remains in the Rochester rotation. 2013 was a long year for Berrios. He went to big league camp in preparation for representing Puerto Rico in the World Baseball Classic. Then, after pitching in the bullpen for Puerto Rico, he was stretched out for a month before joining the Cedar Rapids Kernels. He went 7-7 with a 3.99 ERA and a 1.40 WHIP as a 19-year-old, but he clearly tired late in the year. Fast-forward to 2014 and Berrios was pushed to Ft. Myers. In 16 starts for the Miracle, he went 9-3 with a 1.96 ERA and a 1.05 WHIP. In 96.1 innings, he gave up 78 hits, walked just 23 and struck out 109. Pitching Coach Gary Lucas informed me that in June, he sat down with Berrios, as he did with all pitchers, and discussed his goals. Berrios quickly responded with three goals. First, he wanted to start in the Florida State League All-Star game. Second, he wanted to be named to the Futures Game. Third, he wanted to get promoted to AA New Britain. Check-Check-Check. 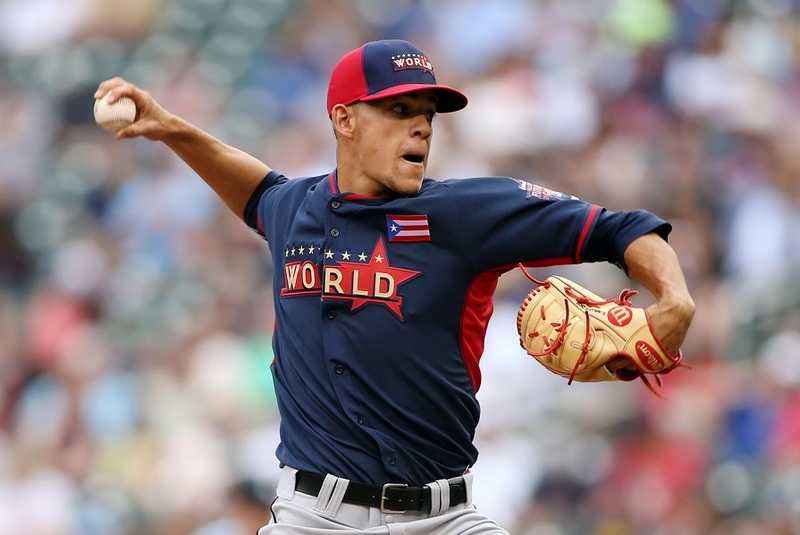 Berrios was the starter for the World Team in the Futures Game at Target Field and threw a 1-2-3 inning. Three weeks earlier he had been the starting pitcher in the Florida State League All-Star Game, and one week before the World Game he had made his AA debut. With the Rock Cats, he made eight starts and went 3-4 with a 3.54 ERA and a 1.11 WHIP in 40.2 innings. There was a scare involved though. In one start, he wasn’t hitting the same velocities he had been all season, and he left the game with a shoulder problem. It turned out to be some shoulder stiffness. He skipped one start and came back without missing a beat. On the final weekend of the season Rochester was still in playoff contention. Berrios was called up to make a start. It didn’t go so well. He gave up six runs in three innings, but what a learning experience for the guy who is, with little doubt, the top pitching prospect in the organization. He was the Twins supplemental first-round draft pick in 2012 out of Puerto Rico. He won’t even turn 21 years old until next May. Though unlikely, it’s not outside the realm of possibility that Berrios could debut with the Twins around that time. In January, JO Berrios was kind enough to do an interview with Twins Daily. Thanks to his aunt, that interview is available in both English and Spanish. There you have it, my Top 6 Twins minor league starting pitchers in 2014. Feel free to discuss. Thanks, Seth. I am wondering which, if any, of these prospects has significant potential to be an ace or a #2. Hard to argue with the guys you have on your list, or even the order you have them in. Maybe there is some weight to the claim Kohl Stewart deserved more than an honorable mention, but not sure any of your guys 1-6 was any worse than Stewy. Gosh it could be fun as these guys make their way up the ladder. Wow that is a nice list and the ten guys behind them aren't that far behind them either. Nice to see a lot of good pitching coming up. I think Kohl deserved to be in the top 6 but that is my only quibble. IMO leaving Meyer out makes sense as he had trouble going deep in games, walked a lot of betters and didn't have a great ERA for a supposedly dominant pitcher. Maybe my expectations are just higher for him than they should be but I was somewhat disappointed in his performance this year. Yes he K's a lot of guys but when you can't throw a strike when you need one that is a problem and his ERA shows that. Guys with potential to be 1s or 2s are Meyer, Berrios and Stewart. Strikeouts can certainly play a big role in prospect rankings, but I look at a lot more than that in this award. Thanks Seth--great article. I pretty much agree with your rankings. I would probably put Kohl in 6th, but just a minor point. I have been very impressed by both Wheeler and Berrios this year and look forward to seeing them in Minnesota soon. I think both can be top of the rotation guys. Kohl was pretty good, especially since he wasn't throwing many sliders (his best pitch).The good thing is we have several pitchers you could argue deserved to be in the top 6. Even though he didn't have great numbers by any means, how about a special shout out or secondary honorable mention to Virgil Vasquez? By all accounts, a great mentor and veteran presence for guys like Berrios. Plus, he did have the 2nd no hitter in the minor league system this year in August! Can't argue with the top six. Can't wait for the relievers and hitters! Vasquez's numbers overall were pretty pedestrian, but his value to the organization obviously isn't in his ability to move up as much as it is to be a model for younger pitchers and to eat innings, helping save the bullpen. The no-hitter was awesome. I couldn't put him in this list, but he served his purpose. Thorpe, Gonsalves, and Hu beg to differ. It's exciting to know we can have this debate with several prospects. Yep, great organizational pitcher. Need those too. For me, what the 19/20-year olds did in Cedar Rapids, even in partial seasons, was more impressive than what the older guys did in Fort Myers/New Britain. Love the depth of the list, and that is infinitely more impressive and important than just who had the best season. Way, way too early to even speculate if Gonsalves and Thorpe have #1 or #2 SP potential. But I am a fan of both. Despite weighing youth vs talent and early results and trying to fruitlessly project 2-4 years from now in a foggy crystal ball, I DO think these two are maybe as intriguing an option as Stewart, Berrios, and just about anyone else in the organization. Seth, just curious, Meyer, overall, had a very successful season. His ERA and Whip were better than some, not as quite as good as others on your top 6. His SO's are obviously very impressive. Understanding it's a 2014 "good season" list, and not a top prospect list, what kept him out of your top 6? I would like to know how these guys on the list (top 6 and honorable mention) stack up as propsects.how many are potentially 3 and 4 starters as well as 1 or 2s? What is your criteria for this list since Pino certainly had a good minor league year. Why would Wei Hu not be on your list of potential #1's? What is he missing? Meyer had good strikeout numbers and a decent ERA... However, he has the highest WHIP of anyone listed (Top 6 of HM), and without doing math, his BB rate was the highest (along with Thorpe). Cool. Thanks Seth! Kind of what I thought. Was curious if the "consistency" factor might have played a part. Please, anyone and everyone, correct me if I'm wrong, but is it safe to say that Gonsalves and Thorpe, despite their youth and inexperience, are probably the highest upside LHSP's in the organization? But looking at options like Taylor Rogers, Pat Dean, Jason Wheeler, Sean Gilmartin, Matt Tomshaw and Brett Lee, who and how would you/we view them as a stand alone prospect ranking? Doc - I'd generally agree with that, but I really wouldn't undersell Taylor Rogers. I think he could be legit. Guys with 150 IP and 115 K at A+ or AA almost always do not become major league starters. Or if they do (because their organization doesn't recognize the issue), they get knocked around until their fate becomes bullpen or bust. There are exceptions and nuance to consider, but I wouldn't get too high on any pitchers in this category. That's why Meyer,Berrios, Thorpe, and (eventually, with K/9 improvement) Stewart, and a couple others are the real hope, and the others are real longshots. Again, this is not a prospect ranking. We'll get to that later in the offseason. Does it concern anyone that Thorpe and Stewart were both used about as lightly as you can use a starting pitcher and they both ended the season injured? I guess I disagree, to use them lightly would be to have them both pitch for E-town all year like most kids in their first full year.